Learn the Internal fixation of medial malleolar ankle fracture with ASNIS screws surgical technique with step by step instructions on OrthOracle. Our e-learning platform contains high resolution images and a certified CME of the Internal fixation of medial malleolar ankle fracture with ASNIS screws surgical procedure. Most fractures of the medial malleolus occur as a component part of an injury pattern involving either the lateral malleolus and/or the posterior malleolus to varying degrees. However, a fracture of the medial malleolus can appear to occur in isolation. It is important to make sure that the energy imparted to the medial malleolus to create a fracture has not travelled through the distal tibia-fibular syndesmosis, the interosseous membrane and exited more proximally in the fibula as in the classic Maisonneuve injury. If this has been excluded, then the relatively uncommon injury of an isolated medial malleolar fracture can occur. Using the Lauge-Hansen classification, these isolated medial malleolar fractures can occur with the foot either in supination or pronation with either a external rotational moment applied across the ankle or with the foot adducted or abducted. The pronation-abduction injury pattern is probably the most common mechanism for generating an isolated fracture. Herscovici described a 4-part fracture classification specifically for the medial malleolus which can offer guidance on how best to fix the varying fracture patterns. 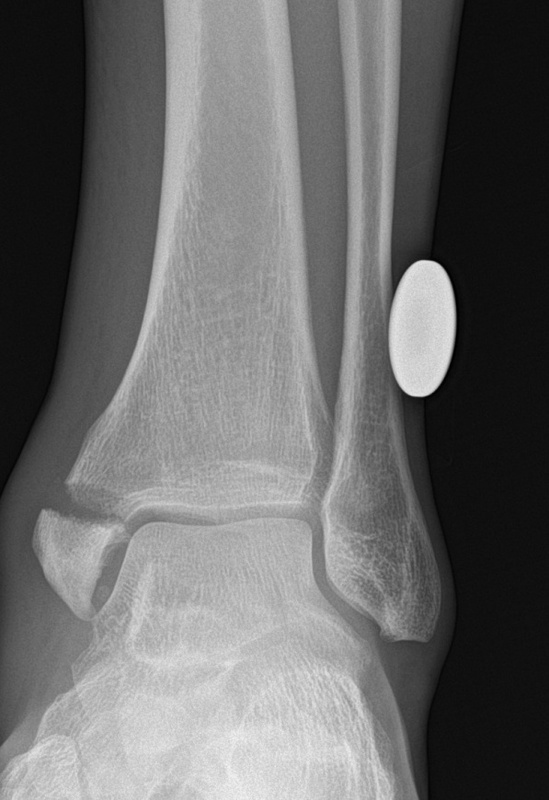 The relatively uncommon Type D injuries occur with supination and adduction creating a shearing force to the medial malleolus and leaving a more vertically oriented fracture line. In my opinion, these are unstable fractures that need internal fixation with an anti-glide buttress plate. Alternatively, multiple partially threaded screws can stabilise these fractures as long as they are placed perpendicular to the reduced fracture line. However, most isolated medial malleolar fractures exhibit a transverse fracture line either at the level of the tibio-talar joint line or immediately distal to it. Therefore, the common methods of fracture fixation are to apply compression either with two part-threaded cancellous screws or application of a tension band wiring technique. In this example, the former technique is employed using two Stryker partially threaded 4mm ASNIS screws. Institution : The Northern General Hospital Sheffield , UK.